JAMES C. WHITE, a prominent farmer and an old settler of La Grange Township, is the owner of three hundred and thirty-five acres of land in Bond County, and is a man well and favorably known. The ancestors of our subject were among those pioneers who came into the State from Virginia and Kentucky, where their names are yet well represented. James White was the father of our subject and his native State was Kentucky, and from there also came Stephen White, the grandfather, who in that section carried on the various employments of carpentering, tanning and farming. He made the journey into the wilderness in 1817, by wagon, and took up one hundred and sixty acres of land on suction 25, in this township, and here he died five years later. The father of our subject came here in 1822 and entered forty acres and here built a log house, and raised and cribbed a crop of corn, after which, having thus proved the fertility of the soil, he returned to Kentucky and brought his family here in the spring of 1823. At that time the Indians had not all departed for other hunting-grounds, and deer and wolves still remained, and, if they could have thought, no doubt their opinions of the invading strangers would have been no more flattering than were those of the noble red men. At this place James White developed a small farm, but died in the year 1844, at the age of fifty-four years. The mother of our subject was Nancy Owens, and she was born in Rockingham County, Va., where she was reared and became the mother of eight children, viz: Clayborn M., Shelton M., John II., Fannie M., Stephen R., Ambrose H., James C. and Catherine J. The mother died here in 1853, at the age of sixty-five y ears, both she and her husband having been consistent members of the church which Alexander Campbell gave his lifetime to establish. Mr. White was a Democrat, as had been his ancestors. The maternal grandfather of our subject was Mason Owens, who was a native of Virginia and served for seven years in the Revolutionary War, which he entered at the age of sixteen as a drummer boy. After the struggle was over he learned the trade of a wheelwright, as he possessed mechanical genius and could fashion almost anything, and also carried on farming. He was one of the early settlers of Kentucky, and also of Montgomery County, Ill., where he died at the age of eighty-six years. Our subject was reared on the farm where his birth took place March 11, 1826. His school days were spent in the old log schoolhouse which he needs no artist to paint and hang on his wall. He remembers well the long walk to reach there, and the rough slab seats, the wide chimney of sticks, the one window covered with greased paper, and the latch string hanging out, which old custom has been taken in modern days for a symbol of hospitality. His school days were few, for the cattle had to be closely watched, and he was the one to assist in caring for the stock. At one time, our subject remembers seeing a herd of deer, numbering forty-five, feeding with his neighbor's cattle, and the wolves were so bold that unless the pigs and sheep were carefully guarded they would not only take tribute, but could be depended upon to carry off the proverbial lion's share. As soon as he was regarded in the family as of enough account to be trusted to make a bargain, our subject was sent to St. Louis to sell wheat and hogs, which he hauled all the way, making the trip in five days, which necessitated a camping out on the way. These trips were usually made by several farmers at the same time, as their numbers were a protection against savages and wild beasts. At the age of eighteen years, our subject began working for himself, and he received fifty cents per day. This was preliminary to his marriage, which took place December 16, 1852, when he espoused Nancy J. 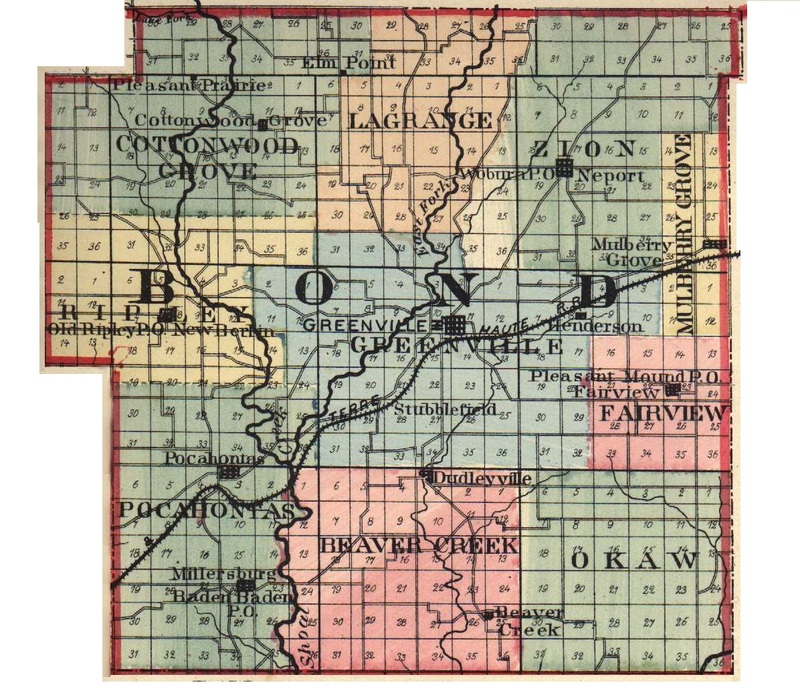 Wood, who was born in this township April 12, 1831. Her people were very early settlers here, and a sketch of her family appears below. The father of Mrs. White was Charles Wood, and her grandfather was Thomas Wood, and both were natives of South Carolina, of German descent. The ancestors came to this country in Colonial times. The grandfather was a farmer and miller, who removed to this county about 1829, and died here at an advanced age. The father of Mrs. White was a mechanical genius and could work at the carpenter's trade, take a hand at bricklaying, or make a piece of furniture; in fact, he must have been a man who would have proved himself a perfect mine of usefulness in a pioneer settlement. His arrival here was in a two-wheeled cart, in which he came across the mountains, being two months on the way, and camping out during the nights. He reached here in 1826. Mr. Wood reached this county with $40, and he then took up eighty acres of Government land and later took eighty more, and, as he prospered, he took more until he finally owned over one thousand acres. He built a log cabin and settled on section 29, in this township, where he farmed very extensively and raised great numbers of cattle, sheep and hogs. Just at this time, he was drafted into the army for the Black. Hawk War, but before he started the war ended. At that time deer and wolves were plentiful, and thousands of prairie chickens flew over the land. No game laws were necessary at that time. Mr. Wood was not much of a hunter for sport, but he could use his rifle with good effect when he so desired, and many were the hungry wolves prowling around his high sheep pen who bit the dust from a shot from that same rifle. There were several small stores in the neighborhood, but Mr. Wood was obliged to haul all of his produce to St. Louis over Indian trails, the trip often requiring five days to accomplish. His death took place when he was sixty-nine years of age. The mother of Mrs. White was Sarah McCormick, who was born in Scotland and came to America with her parents when a child. She reared eight children, as follows: Caroline, Eli, Ezra, Nancy Jane, David (deceased), John, Sarah A. and Ira. The mother died at the ripe age of sixty-nine, a good and noble woman, and a member of the Baptist Church. Mr. Wood had been a strong Abolitionist, notwithstanding the fact that he had been reared in South Carolina, the first State to secede in the late war. Mrs. White was reared here and attended the same kind of school in which her husband received the rudiments of his education. After marriage, Mr. and Mrs. White settled in the home place and lived there until 1860, when they removed here. This was not Government land, but Mr. White has made all of the improvements and has now three hundred and thirty-five acres of fine fertile land. He carries on a system of mixed farming and also handles some stock, although he now rents almost all his land, as he does not desire to pass his latter days in toil. He is a carpenter by trade and has done some building. His home residence is a comfortable large frame house, which he built in 1860. In politics, Mr. White is a Democrat and believes in the principles taught by that great party. Mrs. White is a good, kind woman, a consistent member of the Church of Christ. This worthy couple have never had any children of their own, but under the safe shelter of their roof and by their fireside twenty-seven friendless little ones have found a welcome and a home. No words of the biographer could place this good man and woman more favorably before the public, and this RKCOKD is proud to show to the future this example of true Christianity. "Inasmuch as ye have done it unto the least of these, ye have done it unto me." Extracted 20 Dec 2016 by Norma Hass from 1892 Portrait and Biographical Record of Montgomery and Bond Counties, Illinois, pages 348-350.